Arsenal were back in action with the highly anticipated north London derby at Emirates Stadium. 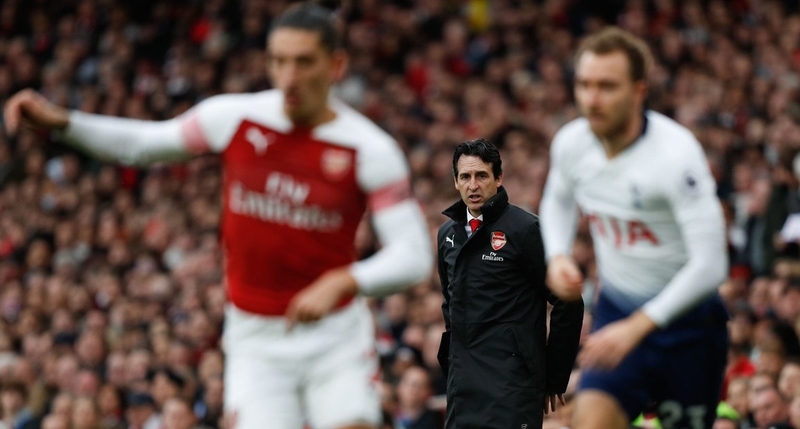 Unai Emery named an unchanged eleven from last weekend’s Premier League away win at Bournemouth, and warned his players that they would need to remain calm both individually and tactically for the full 90 minutes if they were to get the win. It was clear from the very start that Arsenal were under instructions to play at an extremely high intensity straight from kick-off. Pierre-Emerick Aubameyang had an early chance when he managed to get a head to a Henrikh Mkhitaryan cross but his effort went over the bar. Not long after, however, Jan Vertonghen raised his hand to divert a cross into the Tottenham box, and the referee awarded the penalty. Aubameyeng sent Lloris the wrong way with his spot-kick to give Arsenal the lead. Arsenal were playing at a frenetic pace and surging forward in search of a second goal. Alex Iwobi had a good effort well saved by Lloris after strong work from Sead Kolasinac down the flank. Then, quite suddenly, the game was turned on its head in the space of 4 minutes. Eric Dier equalised for the away team with a glancing header from a set-piece. A penalty was then awarded to Tottenham, which Harry Kane converted to put his team a goal up. Shkodran Mustafi nearly brought Arsenal level before the break, but his header hit the bar, meaning a second half comeback would be needed. Unai Emery brought on Aaron Ramsey and Alexandre Lacazette at the break, and it didn’t take too long for Arsenal to get back to the high tempo set in the first half. On the 56th minute Hector Bellerin played a lovely ball in behind the Tottenham defence for Ramsey to run onto. The Welshman played the ball to his left where Aubameyang was on hand to lash a delicious first-time finish just inside the right post and draw the home side level. Arsenal were on the front foot and the momentum was back in their favour. Mustafi, Lucas Torreira and Sokritis all had chances, and Bernd Leno also made a crucial save after a defensive error. With the game hanging in the balance, Unai Emery’s team flooded forward in search of a third goal. Ramsey won possession on the half-way line and played Lacazette in. The French striker turned inside onto his left foot and fired into the bottom left corner to send Emirates Stadium into raptures. And two minutes later, Torreira sealed the win and a superb individual performance with a crisp finish after a perfect through-ball from Aubameyang. A memorable win for Unai Emery in his first north London derby. Arsenal now move into the top 4 and extend their unbeaten run to 19 games in all competitions. The squad now turn their attention to this Wednesday’s match against Manchester United in the Premier League.